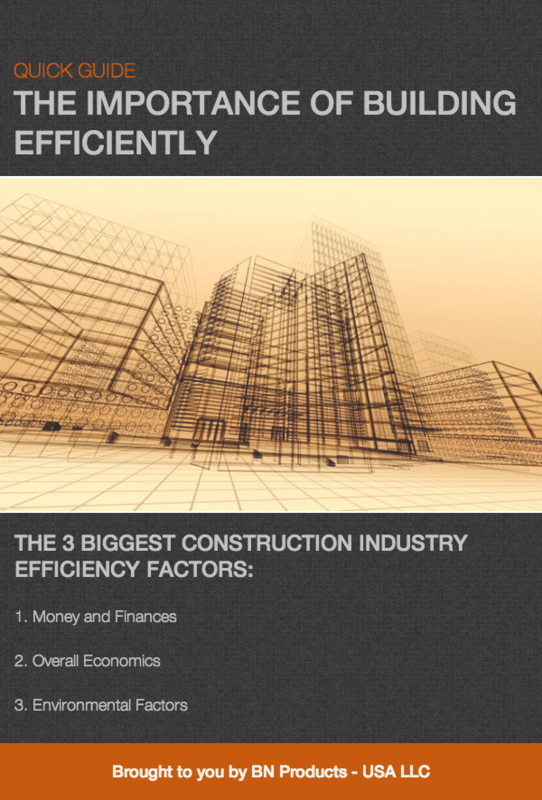 Efficient building is improving building practices all across the board. However, you’ll only see the benefits you desire if you actually implement efficient practices. By applying and understanding the principles below, you will be able to apply efficient building practices to your business and see it grow in a positive direction. Almost every U.S. industry has increased its productivity for the past several decades, however, there has been one outlier, the construction industry. The overall productivity of the construction industry has actually decreased over the past few years. The biggest contributing issues in construction efficiency have been improper waste management, inefficient building practices, and transactional costs. We are going to cover the how-to of efficient building, why you need it for your business, the appropriate tools, effective time management practices, challenges you may face, and the biggest efficiency factors you will want to consider. Efficient building refers to the productivity of your construction site, and the efficiency of your building practices. Another term that can be used interchangeably with efficiency is productivity. Productivity is one of the key factors in any company’s success. This is even more true in the construction industry. You can stand to lose a lot when it comes to the efficiency of your business. If your company isn’t the most efficient one around, you may see your company starting to lose bids, and your overall business may be threatened. The biggest issue is that most construction company’s don’t take the time to focus on upgrading their efficiency processes, or even have a way to measure and track processes to begin with. Overall, efficient building will help you to optimize your business and increase your profits by ensuring there’s no wasted work. Efficient building practices allow you to greatly reduce the bottom line of your business. For instance, if you’re able to accept a project bid and complete the project in record time you’ll be able to take on more projects. The more projects you complete on or ahead of schedule, the more your clients will be pleased and hire out your company for more projects. Face it, the construction industry is notorious for missing deadlines, and having to push project completion dates back by months in some cases. Building efficiency will help to improve overall productivity, and help construction firms actually improve their environmental efficiency standards, and improve their ability to be competitive in a growing marketplace. Improving overall efficiency has impacts that go well beyond the bottom line of your business. The well-being of most Americans is directly tied to the efficiency of the construction industry. Crucial infrastructure that provides jobs and, comfort and more is linked to construction jobs actually reaching completion. The productivity and efficiency of your construction company not only influences your bottom line, but the bottom line of the national economy. Productivity and efficiency is much harder to implement and improve if you don’t have the correct tools to track and measure the new methods you’re implementing. The tools for increasing your efficiency are proper preparation, planning and budgeting. Without these tools it’s easy to get overwhelmed with the bidding and tracking process. After all, the more bids you’re able to submit in an efficient manner the more likely you are to land project after project. It’s a good idea to use cost estimating software to help submit more accurate construction project bids. If you’re able to submit bids that are closer to the actual project costs you’re going to secure more projects. Cost estimating software also allows you to track the winning bids, so you can ensure your beds are getting better every time. Though the right tools are very important to implement on the high level, you shouldn’t discount how the right tools on the jobsite can influence productivity and make your project more efficient as well. Imagine how much quicker a project will go if you invest in a tool such as the Robo Joiner control joints maker for your concrete construction projects. By automating the process of making control joints in wet concrete, work time can be cut in half, which can have a significant positive impact on the overall project. When it comes to managing large scale projects it can be easy for timely data and information to slip through the cracks. When it comes to project efficiency staying organized is of the utmost importance. Once again, web and desktop based software can help to track project completion dates, orders, shipments, and more. Using these kind of tools can help you to minimize the time spent doing organizational work. This means you will spend less time getting new business, and tracking new shipments and more time actually interfacing with your crew to keep the project running smoothly. A big reason construction projects tend to lag is due to lack of communication. Often, this can be remedied by spending more time on the project site and having processes to follow up with the project status. Having oversight and a way to track each step as it gets completed will go a long way towards making sure projects get completed in a timely manner. Adversity is bound to happen on any construction project. Of course, no project ever goes entirely according to plan. However, the more you’re able to monitor each step of the process, the easier it will be to foresee any delays or issues before they occur. Being able to streamline your construction process also helps to minimize room for error. Whenever an error does occur it usually sets back your project completion date. Having a streamlined and efficient series of steps will help your building process time and time again. It can also be useful to have a protocol that you follow every time an issue arises. This will allow you to fix the problem as soon as possible and get your project back on track. We’ve highlighted a few steps you can take to make your business more efficient. However, it is also important to have an industry wide view as well. This will help you see where your business fits into the overall industry. There are major monetary loses every single year due to industry wide efficiency problems. For example, there are loses of over $15 billion annually due to inoperable equipment, and losses of over $7 billion every year due to disputes over project completion and claims regarding project scope. The losses are massive, however, they could be avoided by implementing more efficient building practices. The construction industry has a major impact on the overall economy. For example, almost 8 percent of the entire work force is employed in the construction industry. The construction industry also accounts for over 4 percent of the total GDP. This impact on the economy would increase even more if the energy, equipment, and furnishings were included in the count. This means that any efficiency upgrades to the construction industry will greatly impact the entire economy. According to a recent study the construction industry as a whole accounts for a significant amount of worldwide environmental impacts. For instance, the construction industry accounts for over 40 percent of energy usage within the United States alone. The construction industry also contributes over 40 percent of U.S. greenhouse gases which are linked to climate change. Continuing the impact, construction projects account for over 30 percent of raw material usage, 25 percent of the water used within the United States, and over 30 percent of the materials being shipped to landfills every single year. As you can see, the construction industry as a whole has a very large impact on the environment. By addressing ineffective practices in your own company, you will be able to positively affect not only your team’s productivity, but also your company’s efficiency and profitability.